Elisabeth Perez holds up a sign at the protest that reads “Justice For Michael Brown, Black Lives Matter.” Protests broke out in the streets of downtown Oakland at Broadway in response to the grand jury’s decision not to indict Officer Darren Wilson who shot and killed teenager Michael Brown. Monday, Nov. 24, 2014 in Oakland, Cali. Amanda Peterson/Xpress. UPDATE: Oakland protesters scaled a wall at MacArthur Boulevard to return to I-580, only to be met by police who forced them to turn around. The march back to Frank H. Ogawa Plaza was peaceful with no incidents between demonstrators and police, until it reached the downtown area. Masked protesters dressed in black smashed windows of major banks before hearing boos and jeers from the majority of the crowd. “Peaceful protest,” the marchers shouted whenever the sound of broken glass was heard. Raquel Garcia marched through the streets with her nine-year-old son, Victor Grigg, to educate him. Police formed a line between 7th and 8th streets on Broadway that prohibited protesters near the Oakland Police Department. Protestors demanded the release of eight demonstrators arrested earlier in the night. The crowd turned violent when a bonfire was lit at the intersection of 8th and Broadway streets, a moving trailer rolled through police lines and a Starbucks was broken into. Police announced that demonstrators would have to disperse or risk arrest just after 11 p.m. When no one left the area, police moved in from southern Broadway and both sides of the 8th Street intersection at 11:33 p.m. to disperse protesters, leaving them with an exit on the north Broadway side. 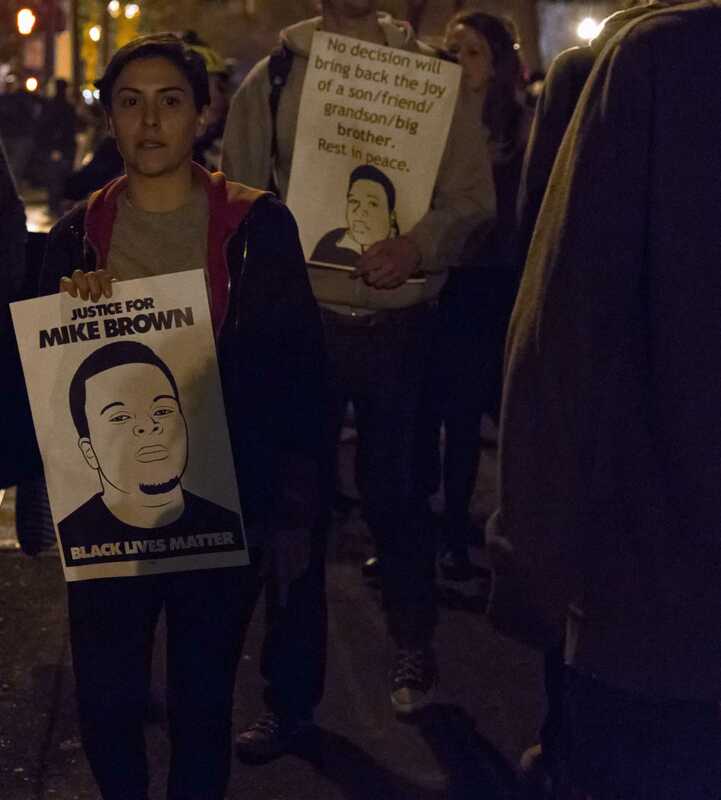 Hundreds of protesters marched in Oakland Monday night after a grand jury brought no charges against the police officer who shot and killed a Missouri teenager. Darren Wilson, the police officer involved in the August shooting of 18-year-old Michael Brown in Ferguson, Mo., was not indicted by a 12-person grand jury, St. Louis County prosecutor Robert P. McCulloch announced shortly before 6:30 p.m.
Oakland was one of several major cities nationwide overtaken by protests in response to the grand jury’s decision. Protesters in Oakland met at 14th and Broadway streets at the Frank H. Ogawa Plaza and moved towards the I-880 freeway. After being turned away by cops, protesters backtracked and made their way to Lake Merritt and onto I-580 where traffic was blocked for approximately 30 minutes. As the demonstration went on, confrontation between police and protesters led to eight arrests at the MacArthur Boulevard and Grand Avenue intersection. Many protesters expressed frustration with the result of Brown’s shooting, including San Leandro resident Adela Muhammad.